I don't know who originally wrote the history of Clarence, my Grandfather, but I'm grateful. It might have been Lillian Condie Lewis or Lorean Lewis Doty, his oldest daughter, or one of his sisters. This is the story that came down to me. On July 15, 1893, Clarence Arthur Lewis was born to Arthur and Rosalie Lewis in Salt Lake City, Utah. 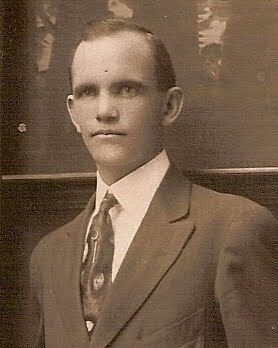 When Clarence reached the age of 16, his father, wishing to provide opportunity for his five sons and six daughters, invested all his assets in an association comprised of several Salt Lake City families, which bought farm land in Capalappa, a portion of land located between Logandale and Overton, Nevada. Adversity struck almost immediately when the 1910 flood covered their land destroying most of the livestock and eventually forcing the association to dissolve. When they first arrived from Salt Lake, the people of the valley wouldn't open up to the Utah people, and Clarence was very lonely. He rode his horse down to Overton. He wanted a friend. One time, Tom Anderson said, "Come home and have dinner with me." From that time, Tom always held out a hand of friendship to Clarence. He soon became acquainted with others and began to have a good time. When his mother had a stroke, Arthur always blamed himself, and so stayed very close to her. Clarence began to support the family. Every bit of his paycheck went to his mother. One time when he was working for Ray Pixton, each night Ray and his father would go into their tent and have a nice warm fire. Before they went to bed, they pulled out their double woolen blankets. They looked so warm to Clarence. When it was time, he would go to his own tent and it would be cold and he'd huddle under whatever he had. When asked why he didn't tell his mother he was sleeping cold, he said, "When your mother has a stroke, you don't take her all your woes." Before he was going to get married, Rosalie told him, whether by writing we do not know, for her tongue was paralyzed, that Ernie and Johnny were getting old enough, and I want you to keep your wages to get married, but it was still hard for him to put away, because he was always looking to see if they had enough food in the house. 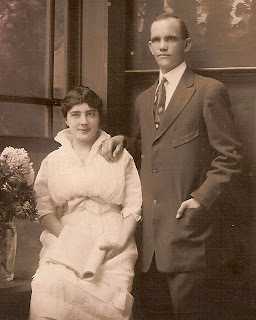 By the time he was ready to marry in 1915, he'd save $1,000.00. He rented land and raised cantaloupe. With the $1,000.00, he and Naomi Henderson bought their furniture. When they had been married a year, they had their picture taken with all their worldly goods. This marriage brought them three children, Lorean born May 7, 1917, Clarvid, born July 27, 1918, and Caroline, born January 21, 1920. What a heart wrenching thing for a man to have to do, for Clarence to have to bury his beloved wife just up the hill from the farm they had worked together on with high hopes for the future. All their plans must have echoed in his head as he rode a plow or planted new crops. How it must have hurt to farm out his children to different relatives. He may have felt his life had been a dream and then he woke to find he had nothing he thought he had. It took a long time to think about love again. Lillian Condie came from Springville, Utah to the Moapa Valley to teach school. Her friend, Eliza Jones, told her about potential prospects including Clarence. Lillian asked, "Does he have any children?" Eliza said, "Nary a one." One evening Clarence and Lillian were at a picture show when the cutest little boy she’d ever seen, with big brown eyes, little turned up nose, and the sweetest mouth—and a face surrounded by a mass of honey colored curls landed in Clarence’s lap. Clarence said, “Where did you come from? Lillian this is my son." Lillian was surprised. She didn’t know he had any children. ﻿ But in any case, in 1923, Clarence married Lillian Condie. Lillian's brother Richard P. Condie conducted the Tabernacle Choir for many years. Lillian restored the children to the family as they were separated and living with different relatives. She bore Clarence three more children, Richard, Paul, and Arlene-. She treated them all as if they were her own. As a young man, President Jones, nominated Clarence for President of the Farm Bureau because he thought Clarence had great leadership ability. He worked with John Wittwer and they really saw eye to eye, and Clarence threw himself into the job. Clarence always pushed for the Moapa Valley. Through the Farm Bureau, he worked on getting Highway 93 brought closer to Moapa Valley by lobbying in Washington, D.C. Whatever was for the community, he worked hard at it. Mr. Lyon once talked to him about tapping the Pioche line to bring power into the valley. He put his energy into that. Many times, Clarence said, "I've just got to farm today." But then someone would come along with a problem and he'd work on that and wouldn't be seen until night. The power did come and a big Bar-B-Q was held and all the official from around the state were there. Clarence was honored for being so valiant in this project. Then they had to find a manager to run the power company. Clarence heard about Ervin Bryner. He hired him. Later he said that Ervin was 90% of the system. Because of his efficiency, service continued to grow. One time when Ben Robison was selling insurance in Salt Lake City, he came upon the pure-pack machine which put milk into cartons instead of bottles. He brought the idea down to the valley and John Lewis, Ben Robison, and Clarence started the Moapa Valley Dairy. Clarence was made President of the association. Frank Lowe built the building. It was successful overnight. They couldn't get enough milk, so they got other people bringing t heir milk and soon the got Mesquite's milk too. They also went to Parowan every day for a truck load of 10 gallon cans, and the dairy kept growing. Then the war came and the boys went to war and Clarence sold his farm to. Clarence and Lillian moved to town and rented a little house, and he remained President of the dairy. At the time that the boys came home from war, there was land for sale in the Upper Muddy, so Clarence and Milton Earl, Ver and Orrin Perkins decided to buy it. Clarence bought the McKay place, Milton the Baldwin place, and the Perkins boys, the Doty place. It cost $50,000.00 to get it. This is where they had their big dairies and Clarence was President for a long time. They offered Larry Page the pure-pack business and it was doing very well when Clarence died. Christmas was the highlight of Clarence's life. He always searched around for the biggest tree he could find. How he loved to fill a stocking. He said, "I can't stand to see a child's stocking look skimpy." So he bought oranges, apples, bananas, harmonicas, whistles and everything he could find to fill their stockings. Christmas morning, he pretended to steal some of the things away, and he had so much fun with the children. He always left something for Santa to eat, then had to eat it so it would be gone by morning. He was always late for dinner. Lillian always asked, why in the world he was late that day. He'd say something like, "This fellow was going to be put on C grade because his barn wasn't right, and I could see he was no carpenter, so I stayed to hang his doors so he wouldn't be put on C grade." Every day as Clarence traveled through Mesquite on his way to Parowan, he delivered milk at J.L. Bowler's store. Mr. Bowler said Clarence had been coming in there many weeks before he found out that Clarence was one of the leading men in the Clark Dairy. When Boulder Dam was going to be built, Clarence went with a group of men to locate a sight. They walked and walked. He went out with a good pair of shoes, and when he came back, they were worn out. They didn't know at the time if t hey would put the dam in the Black Canyon or one other, so they went out and toured for two or three days. Clarence liked to prospect quite a bit. He and True Cooper went out prospecting on the Colorado River one time, and it was at the time that Queho, the outlaw Indian was on the rampage. They climbed to the top of a mountain and found a little cave with water and food stored in turtle shells. He said that from there, Queho could have seen anyone coming from any direction. They were really nervous and decided to leave. That night was the most miserable night they ever spent prospecting. They ate hard b oiled eggs and everything to stay awake that night. He always wondered if Queho was watching them. Clarence always did things well. Whether he was making a pig pen or remodeling the house, the corners had to be square and the molding around the floor had to be finished. He just couldn't stand anything sloppy. 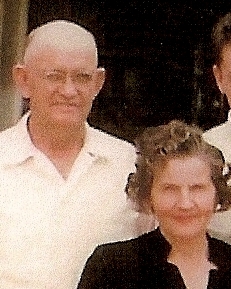 After Clarence and Lillian were married, he was in the Superintendency of the Sunday School and worked with that for several years. When Doctor Hard came, he chose Clarence to be one of his Councilors in the MIA. Once when he was ward teaching at Mrs. Shurtiff's, her dog bit him. She said, "Why that dog aught to be spanked." He said he thought the dog aught to be shot. his work took him away many times. Clarence was always compassionate with others. There are many stories that could be told, but as he did things secretly, I feel perhaps he would rather the stories went untold. He was a man with a great sense of humor. One time when Lillian had left the hot water tap dripping all night, he left $20.00 and a note which said, "This is for letting the hot water run all night." He was poetic in his humor as well. One Sunday, Arlene came home with a poem her teacher wanted her to learn for the next week. The poem read: "When sleep forsook my open eyes, who was it that sang sweet lullaby, and rocked me so I wouldn't cry, my mother." As Clarence had always gotten up to warm the bottle for Arlene's two O'clock feeding when she was a baby, Lillian sent her to her father with the message. I'm sure your father would love to teach you this. When Clarence was finished, the poem read: "And when the night was cold and dark, and hunger made me yelp and bark, who got my milk so I would hark, my father." Another time when Lillian vowed she would not fix dinner until Clarence brought her some vegetables, he left a note saying: "My time in the field will be short, dear, in a moment or two, I will come. La la la la, so sit yourself down on your bum." There is no doubt that Clarence Lewis has been here. All one has to do is look around the Moapa Valley—see the roads and power lines—and one will see his hand has been there. Clarence died September 18, 1957 in Overton, Clark County, Nevada of a heart attack.